Relax on the waterfront in your private luxury condo at Sofi B Lake Retreat! This high-end condo offers quality finishes throughout. From the dark floors and stone fireplace to the claw foot tub and granite counters, you will love every inch of this condo. 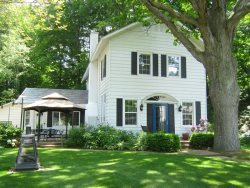 Tucked on the Saugatuck Harbor waterfront, the location is priceless. Gather on the lower balcony to catch an evening sunset or kick back on the master suite's upper balcony which has harbor and swimming pool views. Conveniently located in downtown Saugatuck an equal distance from the center of Douglas as the center of Saugatuck, you'll have the option of either community for exploring by foot. Head to town for shopping, fine and casual dining, Broadway-quality theater, and countless ice cream shops. There is something to do for everyone. Back at Sofi B Lake Retreat, you will love the open floor plan of the main level. Open great room with a high end kitchen, formal dining space, and comfortable living room. The high end kitchen has stainless appliances including a double oven, granite counters, and snack bar space. The dining table is set up for 6, but can easily expand to seat 8. In addition to the waterfront views, you will love the flat screen TV and gas fireplace in the living room. Curl up and stream the latest Netflix series or use the Bluetooth speakers to listen to your favorite tunes. Upstairs you will find three tranquil bedrooms and two full bathrooms. The master suite is sure to please. Situated at the font of the condo with waterfront views, you will have access to your private upper balcony with outdoor furniture. The master ensuite is a true gem - glass and custom tile walk in steam shower to awake your senses in the mornings or help you relax in the evenings. Plus, a separate claw foot tub perfectly positioned in the window so you can watch the harbor while easing the day away. Whether you're looking for a romantic getaway, a girls shopping weekend, a family holiday quality and meal time, or a boys golf weekend, this condo is perfect. We look forward to welcoming you to your home away from home.